05/26/2011 8:39 AM - DES MOINES – Iowa Barnstormers Interim Head Coach J.T. Smith announced today that the Arena Football League franchise has reached agreement with WR Marquis Hamilton, DB Chris Singleton and LB John Jackson for the remainder of the 2011 season. The signings couldn’t come at a better time for the heavily injured Barnstormers who will potentially be without 5 regular starters for this Friday’s game vs. Utah. Hamilton (6-3, 222) joins the Barnstormers for his rookie season in the AFL. He spent the time in camp with the Minnesota Vikings in 2010, following four seasons at Iowa State University. While with the Cyclones, Hamilton played in 49 career games racking up 127 catches for 1,509 yards and 8 career touchdowns. The native of Oklahoma City is a former prep standout in Oklahoma. Singleton (5-10, 194) re-joins the Barnstormers after failing to make the team during training camp. Singleton also played for four seasons at Iowa State University from 2005-08, where he was a three year starter at Defensive Back. For his career, he totaled 127 tackles and 5 interceptions, including a team high 4 in 2007. Jackson, (6-0, 250) comes to the Barnstormers after spending parts of the last two seasons with several AFL teams, most recently the Georgia Force. He played against the Barnstormers with Peoria (af2) in 2009, where he recorded 12 tackles, 2.5 sacks, 2 fumble recoveries and a touchdown. The Knoxville, TN native played college football at Tennessee Tech University. He appeared in 33 straight games from 2005-07, collecting 111 tackles, 20.5 for loss and five sacks. The Barnstormers return home for two straight games, beginning this Friday, May 27 when they battle the Utah Blaze (5-4). Kick-off for this nationally televised contest airing on NFL Network is set for 7:05pm. Great seats are still available. 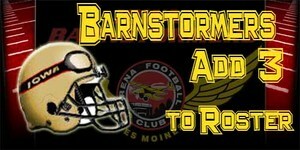 To order your tickets, call the Barnstormers main office at 515-633-2255 or visit www.theiowabarnstormers.com for more information.